The city of Ottawa is dealing with flooding in several areas including Fitzroy Harbour, Constance Bay, Britannia, Dunrobin, Mclaren's Landing and Cumberland. 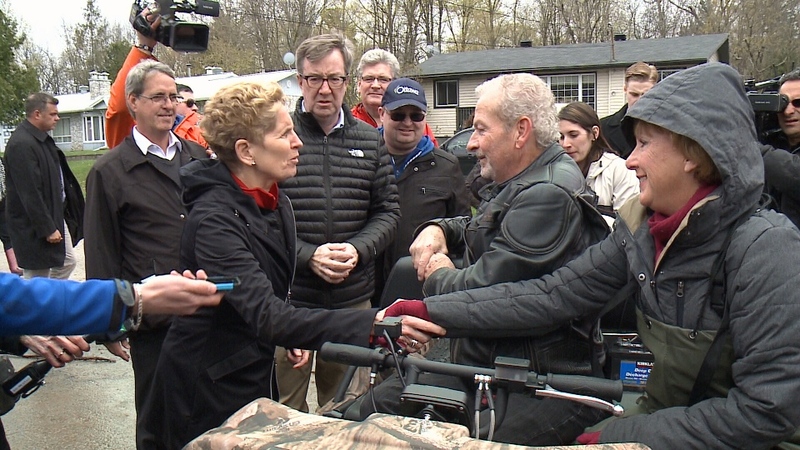 Monday afternoon, Ontario’s Premier Kathleen Wynne visited two of the affected areas with Ottawa’s mayor Jim Watson. Along the Ottawa River in Cumberland Village, Michel and Maggie Bourbonnais didn’t expect they would need an Argo to get around their neighbourhood. These are stressful times for the couple. And that was the Premier’s intention, too, flying in to Ottawa today to meet with flood victims in two areas of Eastern Ontario, including Cumberland and Clarence-Rockland. “I’m sorry we’re meeting under these circumstances,” she told one man in Clarence-Rockland. Wynne says her government is trying to ensure the municipalities and residents know what help is out there for them. “I’m here because I want people to know we are going to continue working with the mayors and make sure everyone has the information they need,” Wynne said, down the road from the Bourbonnais’ home surrounded by water. According to city officials today, 310 homes have been impacted by flooding with 75 families displaced. Worst hit is in West Carleton, where 275 homes have flooding issues. 25 homes in Cumberland have been affected and another 10 in Bay Ward. - 1:00 p.m. at the Nepean Sportsplex Halls C and D, 1701 Woodroffe Avenue. The Rideau Valley Conservation Authority says measurements of the Ottawa River indicate the levels have actually stabilized though people living in the flooded areas haven't really noticed that yet. The city of Ottawa says once the water starts to recede, it will kick into recovery and clean up mode. That will take weeks if not months. In flooded areas like Constance Bay that are on well water, the city is advising residents not to drink the water and to wash if you come in contact with surface water that can also be contaminated.